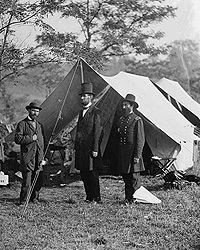 Allan Pinkerton, President Lincoln, and Maj. Gen. John A. McClernand at Antietam, Md. It was a hard fall for the ambitious general. “McClernand had high postwar political aspirations,” wrote Duane Schultz in The Glorious Fourth. “As the conqueror of Vicksburg, he believed he would go far, perhaps all the way to the White House. And there was more. The fifty-year-old McClernand was about to marry the twenty-six-year-old sister of his late wife. 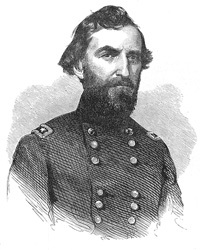 What better way to impress his new bride than a honeymoon on the Mississippi River, culminating in his glorious capture of a major Southern stronghold?”4 But less than a month before the fall of Vicksburg, McClernand was sent back to Illinois by his commander – his military and political careers in shambles. General McClernand was enthusiastic, enterprising, courageous, brash, and undisciplined. He was also trouble. For President Lincoln, General McClernand was both a political asset and a military problem. Back in Illinois, McClernand even had political clout with the Republican Governor, Richard Yates. In the councils of his military superiors, he had none. So in the middle of the siege of Vicksburg, McClernand was dismissed from his command by the general commanding the attack, Ulysses S. Grant. 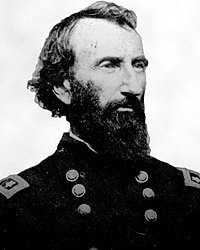 Generals Grant and McClernand clashed from September 1861 until he was dismissed in June 1863. 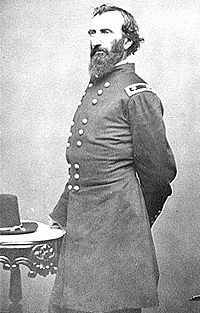 What really injured McClernand was not only Grant’s enmity, but the intense dislike of most of Grant’s professional friends – including William T. Sherman, John Rawlings, and James Harrison Wilson. Even Charles Dana, the War Department’s civilian eyes and ears in the Mississippi campaign, adopted their contempt for McClernand. According to biographer Richard L. Kiper,, “McClernand quickly responded to his benefactor. ‘Accept my grateful acknowledgment for your kind commendation,’ he wrote. He then took advantage of their rapport to provide the commander in chief advice on conditions in the western theater. 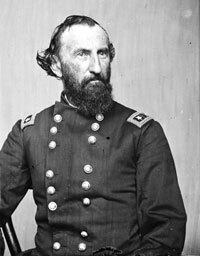 Success had been rare because of the lack of a unified command.”11 McClernand performed competently over the next nine months, but was frustrated by being subordinate to generals like Ulysses S. Grant. In August 1862 he sought and obtained a furlough to go to Washington about raising new troops. Mark A. Plummer, Richard J. Oglesby, Lincoln’s Rail-Splitter, p. 72. Michael Burlingame and John R. Turner Ettlinger, editor, Inside Lincoln’s White House: The Complete Civil War Diary of John Hay, p. 240 (October 11, 1863). Richard L. Kiper, Major General John Alexander McClernand: Politician in Uniform, p. 311. Duane Schultz, The Most Glorious Fourth, p. 74. Josiah Busnell Grinnell, Men and Events of Forty Years, p. 174. David C. Mearns, editor, The Lincoln Papers, p. 160 (Letter from John A. McClernand to Abraham Lincoln, May 26, 1847). Richard L. Kiper, Major General John Alexander McClernand: Politician in Uniform, p. 7-8. Thomas F. Schwartz and Kim M. Bauer, “Unpublished Mary Todd Lincoln”, Journal of the Abraham Lincoln Association, Summer 1996, p. 2 (Summer 1996). Richard L. Kiper, Major General John Alexander McClernand: Politician in Uniform, p. 20. Roy P. Basler, editor, The Collected Works of Abraham Lincoln, Volume V, p. 20 (Letter to John A. McClernand, November 10. 1861). Richard L. Kiper, Major General John Alexander McClernand: Politician in Uniform, p. 49.